Whether I’m visiting gardens, flower shows or simply walking around the countryside, I’m always looking for new planting combinations that work really well together. Because of the challenging growing conditions this year (i.e. 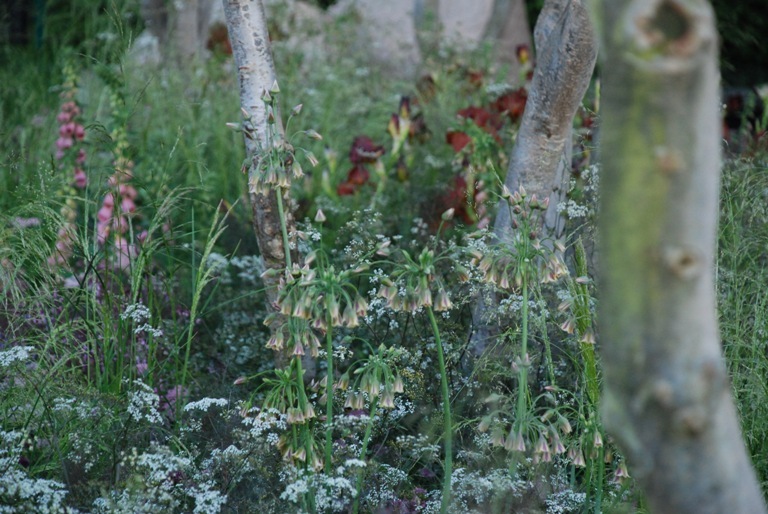 a hot, dry Spring) we saw different combinations of plants at Chelsea Flower Show this year. There was a lot of orange and purple/mauve in the mix. Look how fabulous the orange Geum looks with the Nepeta in ‘A Monaco Garden’, designed by Sarah Eberle. Mauve, purple and blue look fabulous with orange, but be sure to keep the tone of the colour the same. A pastel peachy colour will work better with a lilac of pale mauve and a dark purple flower will look much better with a deep rich orange. If you put lilac, for example, with a vibrant orange flower, you’ll find that the orange feels much too dominant. As well as the colour combination, it is the contrast in plant form that really makes this work. 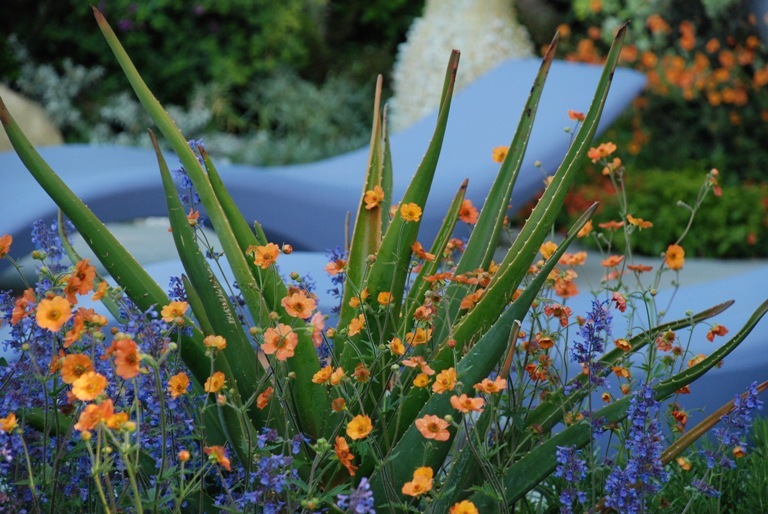 The strong architectural shape of the Aloe is softened by the feathery flowers of the Nepeta and the round orange flowers of the Geum just brings the whole look together. 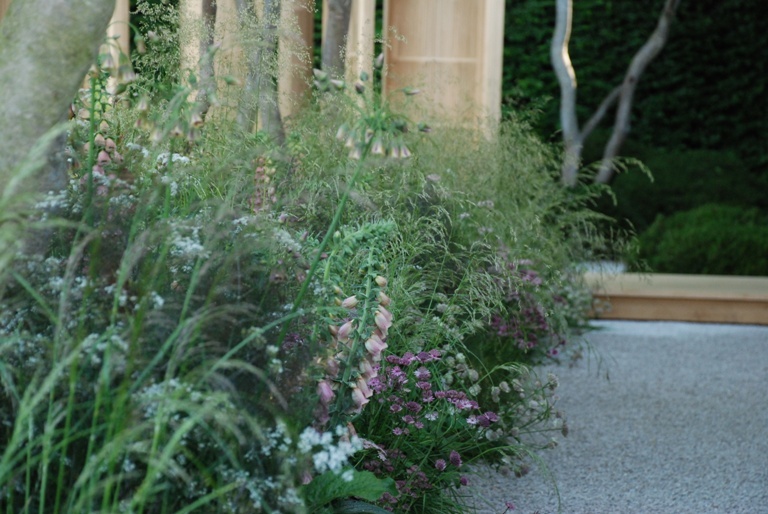 In contrast, the planting scheme of the Laurent Perrier Garden, designed by Luciano Giubbilei, was soft, calm and romantic. The plants give a frothy, delicate feel to the space and the colour palette is cool and muted, very “summer” in colour psychology terms. The planting schemes at Chelsea only need to look good for a week, but when you’re creating your garden at home you’ll need to think about how many months of the year you’d like interest. In the Winter there would be nothing to see in this flowerbed so if you’re going for this look during the summer, you might want to think about planting lots of bulbs that will provide some interest throughout the ‘bare’ seasons. Although this planting scheme would be high maintenance (lovely or not, herbaceous plants just are!) I just think it looks beautiful – soft, elegant and natural. If you want to create this soft look at home, grasses and soft foliage plants like fennel (used here) will really help. Keep the plant palette to a minimum (the less is more!) but think about “what flowers when” to ensure that you have enough interest at least for the months when you will be out in the garden.